Thank you for your loving service to our community! Here are the responsibilities expected of you as oneg or board host. If you would like to sign up to be a board or oneg host, please visit our hosting sign-up page. Direct any questions to the board host. Challah is required. Other items are potluck. Arrive about 30 or more minutes early to allow time for setup. You’ll find instructions on the kitchen cabinets and the board host will guide you. Set up the large table with challah and any other food you have brought for Oneg. Rabbi Sparr will take care of her own Kiddush cup. In addition, put out small plates, napkins, and silverware as needed. 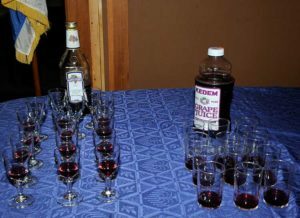 Put a small amount of wine and grape juice in wine glasses for the Kiddush. Leave the bottles behind the glasses (we usually need about 15-20 for a regular Shabbat service. Make coffee and hot water for tea. Set out mugs, sugar, cream etc. Do the dishes—fill the dishwasher and start it. Detergent can be found in cabinet next to the sink. Please plan to arrive at least 30 minutes prior to the service. Turn up heat or turn on air conditioning as needed. Set up Shabbat candles. Make sure the candles are secured in the candlesticks with melted wax. Also, set up and light (then extinguish) the shammus candle. Check in with the Rabbi and identify who will light the Shabbat candles. Make sure door is locked if no one is there to watch it, including during services. Put away prayer books and pick up where needed. Take home tablecloths to wash and return them to the temple. Turn out all lights in the sanctuary and kitchen. Make sure door is locked.